ANGER / malice from riviera: the promised land · if that's the case, then I have nothing to lose. Being defeated once again by Ein, Malice barely manages to survive and escape. There are still two more souls needed to obtain enough energy to unseal Seth and allow Hector to become an absolute god. With the last of her energies, she captures one of Ein's companions and offers her to Hector, with the final sacrifice being herself. Master Hector! Use this Sprite's soul to revive Seth...! Complete the ritual! For the sake of Asgard! Take what is rightfully yours! Alright. This will be the dawn of a new era! With the two final sacrifices, Hector has enough energy to start reviving Seth. As he's doing so, he lets out the truth about Malice. Even a false angel has her uses. Malice was not a true Grim Angel. She tried to become one, but failed. She lacked the skill... So, I fashioned a Diviner for her... It looked just like the real thing. I needed a pawn, you see. And she thought she was sacrificing her future! Muhahahahaha! She actually believed she was a Grim Angel! I'm sure she was happy to be my puppet. Because otherwise, a failure such as her would have been completely useless. In truth, Malice's future was never lost. She never needed to sacrifice her own life for a better future. Hector's plan was to revive Seth to merge with her, and use her powers to create a new world for him to rule. The Grim Angels, Asgard, Riviera, everything - Hector never cared for those things; everything would have been destroyed to make place for his new toybox to play with. All the while as Malice believed in him, and actually wanted to help him create what he described to her as a perfect utopia under which her kin would have lived in bliss. The information available about Grim Angels in the Dept. Heaven Episodes World Guidance book and the presence of characters who look a lot like Malice in Yggdra Union and Knights in the Nightmare, both of which take place before Riviera in the Dept. Heaven timeline, also hint to another point about Hector's plans that is not necessarily very clear in Riviera itself. Since the Grim Angels can only be awakened in time of need, that meant that Hector could have not done so himself; his dark motives would have prevented the Grim Angels from being awakened. And since they were born from the original sacrifice of the gods of Asgard, they couldn't be reborn again. However, to succeed in becoming an absolute god, he needed the Grim Angels; he needed their power and the fact that they are agents of the gods, therefore automatically justified in their deeds. Because of this, Hector had been trying to create artificial Grim Angels that could look just like the real item, but would have been part of his personal army to further his evil ambitions. It is of note that Hector's creations all seem to look a lot like each other, suggesting that they all share traits of some progenitor. As previously seen in the Reincarnations subsection, two artificial angels that would prove to be failed experiments appear in Yggdra Union and Knights in the Nightmare: they are test subjects #367 and #549. Malice, #1132, is confirmed to be one such artificial angel; although she was in a sense a failed experiment, Hector let her believe that she had become a true Grim Angel so that she could have compensated for her lack of skills with her pride. With her morale high for succeeding at becoming a Grim Angel, she played her part as if she were a real one, and acted exactly like Hector wanted: even if technically she wouldn't have been up to the task, her attitude towards her mission made her the pawn that Hector needed. It is of note that, in the audio drama, Malice is shown to be also successful skill-wise; in either case, the end result proved to be the same. This also leads to another unsettling theory: if Malice is confirmed to be a fake, then what about Ein and Ledah? They were also chosen by Hector, just like Malice. 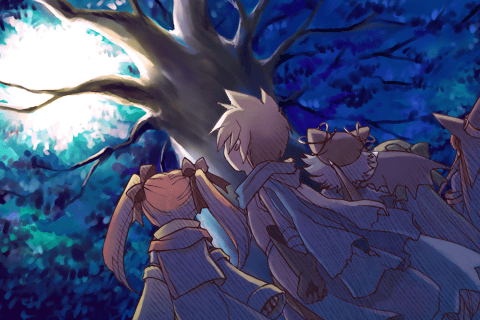 And if Malice's Diviner was fake, how come it resonated with Ein's when they fought at Lacrima Castle? There is a possibility that all of them are fakes. After all, it would have been easy enough to let the earnest and naive Ein believe that he had to give his wings in exchange for his Diviner. And it wouldn't have been hard for Ledah, always so dedicated to his mission, to convince himself that his emotions would have interfered with his task, causing himself to shut them down. In addition, his final words would lead to believe that, when he died, he wasn't fully emotionless. This is naturally just a theory, but it would mean that Malice might have shared much more with Ein and Ledah than what one would think, and that the condition of being "a real Grim Angel" around which Malice based her whole self-worth might not even exist. I just had a horrible thought... What if this was all part of the gods' plan? What if we're just puppets in their show? Do we really have any control over our future? Malice never knew about Hector's betrayal, and died knowing that her mission had been accomplished, and that her existence hadn't been meaningless. 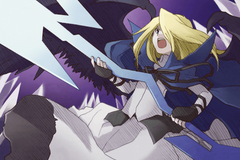 In a way, though, her death was avenged, as it served the ultimate purpose to allow Hector to merge with Seth, which was how Ein was able to destroy both of them under the form of Seth-Ra. With them out of the way, both Asgard and Riviera will live the peace Malice had hoped for. 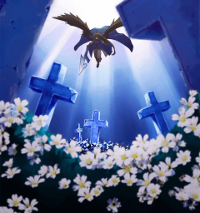 In spite of everything, she died thinking that in the end her life had accomplished its purpose; in a sense, her hopes would be realized by Ein and his friends defeating Hector and Seth. With the destruction of Seth, an imbalance was created in the order of the cosmos; her opposite, the guardian of Riviera Ursula, was doomed to die as well. But... But who will protect Riviera? Those who live there... Those who have a future.